On Tuesday, Sept. 4, the College of Wooster men’s and women’s golf teams were notified through the athletic department that their respective head coaches would be replaced by one coach that would head both teams, instead of having two different head coaches for each team. Both coaches for each team, Lisa Campanell Komara and Rich Danch, were told they may both apply for one head coach position, meaning that they will be competing for the position. 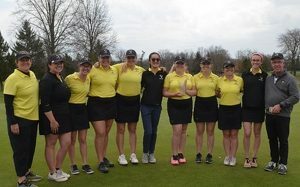 For the women’s golf team in particular, Coach Lisa Campanell Komara and her young squad consisting of no seniors started their year off stronger than ever. Against Division-II and Division-III teams, the group has rallied a 40-4 record. Adding to their success, program records were broken as Hannah Appleman ’20 scored a 75 at the Laura Bump Invitational on Saturday, April 7 and the team as a whole scored 318, a record-best score. The team displayed that they have been working hard day-after-day to create a legacy that the College and their fans would be proud of. According to Emily Stoehr ’20, co-captain of the team, the team has achieved more than imagined. “This past year, we have exceeded expectations set for us, at least the past two years that I’ve been on the team. Each individual contributes to our success, whether it be with a low score or the immense support we all have for each other,” Stoehr said. “As a player, I’m really proud to be on this team and have the opportunity to grow within such a positive environment with my coaches and teammates.” Megan Gronau ’21 also commented on the group’s success. The team’s spring break trip to Hilton Head, S.C. was also successful as it allowed the team to play against competition from across the country. “We were able to play some of the best courses in the area and as a team, and we were able to bond and create even better friendships than we already have. This is a super valuable time for our team,” Stoehr said. “The trip is necessary for the team, so as we start our tournament play in the spring, everyone is ready to compete,” Gronau added. For the Scots, the season had been nothing short of phenomenal. But there is one detail that validates their achievements even more and demonstrates the strength of the team — their Coach, Lisa Campanell Komara, had been fighting Stage 3 breast cancer throughout the season. After her diagnosis in January 2018, Campanell Komara endured a nine-month journey of chemotherapy treatments and radiation. The team stood behind her, and with their support, she was soon found cancer-free. With a new journey of recovery instead of hardship in the forefront for Campanell Komara, the group was eager to progress into their season. But on Sept. 4, 2018, the team was hit with another tough blow — the College was to adopt a coaching model consisting of one head coach for both men’s and women’s golf teams. Members of men’s and women’s golf teams received an email from Athletic Director Keith Beckett and Assistant Athletic Director Ashley Reid, stating: “We would like to meet with you briefly on Wednesday, Sept. 9 in the Scot Center . . . In the 2019-2020 academic year, the college will adopt a model that is aligned and used successfully with/by numerous programs within our conference and the NCAA Division-III in which both programs are coached by one combined head coach and one full-time assistant.” The women’s team all shared the same level of surprise, with many concerns that arose. “Over the past few years, both the men’s and women’s teams have been successful, and the fact that that there might be a change to our current model is hard to understand,” Gronau said. “Our program is going to be completely restructured and we have no say in the matter. We were informed that the meeting would occur only 48 hours ahead of time and were not told what it would be about until the meeting itself,” Appleman added. Campanell Komara and her team still haven’t received a reason from the athletic directors or the President of the College Sarah Bolton, on the job termination. As of April 5, 2019, there has been no change on the decision, and the College is proceeding to end her employment. In addition, Rich Danch has been notified that his job may be “evaporated,” per Keith Beckett. The singular coach that will be overlooking both teams for the 2019-2020 school year has yet to be announced. Although the announcement came as a shock to all involved, the women’s team still looks forward to end the year positively. The team realizes they still have a season to finish, regardless of the circumstances. “They are so strong and determined to keep improving and moving forward. Our work is not done, as we want to challenge with DePauw, Witt and Denison, and not let anyone else in the conference catch up to us,” said Campanell Komara. The women’s golf team keeps their season going as they will host their own Spring Invitational held at the Mohican Golf Club in Jeromesville, Ohio. Official start time is slated for Saturday, April 13 at 1:00 p.m. Their next home matchup will be against the Denison University Yeomen on April 28.